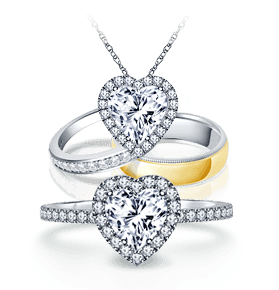 Our personal shopper will provide you with various options for the engagement ring you desire that is based on your preference, taste and budget. Our customers have shared their engagement stories. We are sharing them with you to help inspire your own story. Watch our exclusive video and learn with experts how B2C Jewels can create your Dream Ring. "Better TV" helps you find the perfect diamond engagement ring with B2CJewels. There are many types of engagement rings and each one is beautiful. Read on to make an informed choice and to save more. The most popular style is the solitaire engagement ring. There is only one diamond on the band. This design is classic and many people choose it because it never goes out of style. The next style is the side stones ring also known as accent diamonds ring. It has a lot of sparkle but may not be a good choice for someone who works with their hands a lot or someone who has to wear gloves for work. Another popular choice is halo rings. The center diamond is fully surrounded by a 'halo' of accent diamonds. The halo and the center diamond together give the appearance of one big stone. Halo diamond engagement rings are a smart choice when you want a big-diamond look on a budget. Next, there's the three stone ring. There are two smaller diamonds on either side of the center diamond. These two side diamonds are usually half the carat weight of the center diamond. The three stones are said to represent the past, present and future and the style has a romantic appeal. A setting is that part of an engagement ring that secures the diamond to the rest of the ring. A prong setting is one of the most common setting for diamond engagement rings. The main advantage of prongs is their simplicity. They hold the diamond above the band of the ring and allow plenty of light to pass through the diamond, helping it to sparkle. Next, we have the bezel setting. A thin metal border fully surrounds the diamond around the girdle, making it a very secure setting. There are different types of settings used for accent or side diamonds. One such style is called pave setting. Diamonds are set together very closely by tiny beads of metal. The beads blend with the metal band, so when the diamonds are set, they disappear against the background, giving the band a diamond encrusted look. Round diamond engagement ring in solitaire style is the most popular ring. Other popular ring shapes include princess cut rings, oval diamond rings and cushion cut rings. Emerald cut rings and Asscher cut rings are a good choice for people who like understated sparkle. 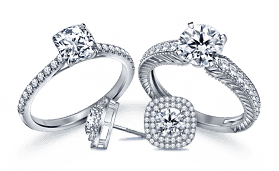 Diamond engagement rings are available in two basic metals platinum and gold. Both are durable and beautiful. Gold engagement rings are available in yellow, white and rose gold. White gold has a coating of rhodium, which makes the ring look white. Rose gold contains copper, which gives rose gold rings their distinctive pink hue. 18K gold and 14K are alloys of gold. 18K has about 75% gold and 14K has about 55% gold. Running out of time but want a beautiful ring? Check preset engagement rings. These diamond rings for women have the center diamond already mounted. Faster to ship, these rings are perfect when you want a budget ring fast. Choosing an engagement ring is an important decision and you want to get it right the first time. B2C Jewels has a try at home service for engagement rings. Customers can try up to three ring replicas at home before ordering a ring. 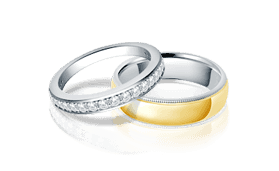 Did your partner love a ring but the cost has you worried? With our personal shopper service, you can design your own ring. All you have to do is send a sketch or an inspiration photo. We will give you your desired ring at the right price. Sometimes you may want changes in your ring, such as resizing or little touch ups. We would be happy to make the changes, at no additional cost. We pride ourselves on our quality products and we’re sure you will love your engagement ring. But, if you wish to return the ring for any reason, we have a 30-day no-questions-asked return policy.